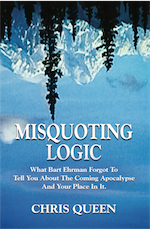 Author of Misquoting Logic What Bart Ehrman Forgot To Tell You About The Coming Apocalypse And Your Place In It and Misquoting Calculus What Isaac Newton Tried To Tell Bart Ehrman and Misquoting Calculus What Isaac Newton Tried To Tell Bart Ehrman. Speaking here to things inside the mind and heart. New covenant not like the old. “But very truly I tell you, it is for your good that I am going away. Unless I go away, the Advocate will not come to you; but if I go, I will send him to you. 8 When he comes, he will prove the world to be in the wrong about sin and righteousness and judgment: 9 about sin, because people do not believe in me; 10 about righteousness,because I am going to the Father, where you can see me no longer; 11 and about judgment, because the prince of this world now stands condemned. Now there is no other path except the narrow gate which has to do with being reconciled to God through Jesus by his indwelling Spirit. You cannot attain “love” the goal of this command (Christ’s Command John 15: 17) which come from a “pure heart” a “good conscience” and a “sincere faith” by commandments of the law which you cannot keep (Romans 7). Meaningless talk as Paul calls speaking about the law. Teachers of the law “do not know what they are talking about.” Yet confidently boast. Bring you broken heart to Jesus and he will mend you as a new creation. His promises are good. Chris Queen. 3/28/2019. Please hit the follow key above and to the right for updates. Please leave your valued comments below in the form. There are more posts below the form also. Go to Blog above in the menu to access over 200 posts. I will be perfect when I look at Jesus face to face and not until. Anyone claiming otherwise preaches the Oscar Meyer gospel. BALONEY. Be reconciled to God. Shameless capitalist advertising here below. Links to books and free excerpts in other posts or his the book cover icon above. God wants his glory and I want him to have it. God wants to bless you in Jesus and I want you to have that. READ THE FREE EXCERPTS Get the Paperback for $ 12.30. Amazon! A child I know ran from his bedroom last night. He brought the Bible his daddy has given to him. He is very proud to have it and to show it to me. He said he is reading Genesis. I told him I am proud of him for reading the Bible. I am praying for him that he is encouraged by the Spirit of Truth to continue in the Word to find the Lord and his truth for his life. Jesus alone is the gate through which God has created to find him. The reality of knowing Christ as Lord is a matter of the Father’s mercy and love. Gentiles were not raised in a nation called Israel under a constitution given by Moses. Jesus fulfilled the law as the only one able to do so. (Acts 15) In our day, we have many who try to overlay Moses on Jesus. Galatians separates this error, from the gift of the Spirit. Paul preached the “mystery of Christ” Jesus telling Ananias to lay hands on Paul as his chosen instrument (Acts 9: 15). Paul tells us what he received he received by revelation from Christ and not from men. Proof positive for all who believe that it is different from what was attached to the constitution of Israel, which was what and where Jesus taught. Jesus here speaking in Israel, more specifically at the temple in Judah (separate from Israel in Jeremiah 31) where the law was in force and the Scribes and Pharisees had the power of life and death. Jesus told them the truth and they were offended and had him killed, also prophesied. 30 years or so later, the nation of Israel was destroyed as well the temple. Because they rejected God’s plan, the Messiah, Jesus. He rose from the dead, as the apostles testify. “At that time Jesus said, “I praise you, Father, Lord of heaven and earth, because you have hidden these things from the wise and learned, and revealed them to little children. 26 Yes, Father, for this is what you were pleased to do. “You, my brothers and sisters, were called to be free. But do not use your freedom to indulge the flesh; rather, serve one another humbly in love. 14 For the entire law is fulfilled in keeping this one command: “Love your neighbor as yourself.” 15 If you bite and devour each other, watch out or you will be destroyed by each other. 16 So I say, walk by the Spirit, and you will not gratify the desires of the flesh. 17 For the flesh desires what is contrary to the Spirit, and the Spirit what is contrary to the flesh. They are in conflict with each other, so that you are not to do what ever you want. 18 But if you are led by the Spirit, you are not under the law. Chris Queen. 3/27/2019. Keeping in step with the Spirit. Very encouraged those near me come to Christ. Please hit the Follow Key above and to the right for future updates. Please leave your valued comments in the form below. More posts under the form. My books Misquoting Logic HERE and Misquoting Calculus HERE open the gospel of grace through faith in Jesus and his transformation by the Spirit of truth (Jeremiah 31: 31-34) (John 16: 12-14) (Galatians 5: 22-26) (Ephesians 2: 8-10). The Truth has taken a beating and come out bleeding in the ridiculous collusion accusations, next in the 737 Max and today the beginnings of distraction by the media toward the dismissal in the Jessie Smollett case. The questions here with respect to men and their politics run to what sort of world and country we want to leave to our children and grandchildren? James was the leader of the church in Jerusalem in the early years of the body of Christ. James was among those who saw his brother, Jesus, the Christ (Greek for messiah) alive after the entire city saw him dead. The fact that there are but five chapters in this book have made it what I call the “shoddy shortcut” inasmuch as the misreading or rather poor comprehension and ability to synthesize (gather information from what is read) have made this so. But even then ignoring the verses about the corruption of your gold and failings in helping those in need because we now know, as opposed to what Jesus commanded, that “poor choices” is what really happened. We are so much smarter than Jesus now. “What good is it, my brothers and sisters, if someone claims to have faith but has no deeds? Can such faith save them? 15 Suppose a brother or a sister is without clothes and daily food. 16 If one of you says to them, “Go in peace; keep warm and well fed,” but does nothing about their physical needs, what good is it? 17 In the same way, faith by itself, if it is not accompanied by action, is dead. 20 You foolish person, do you want evidence that faith without deeds is useless[d]? 21 Was not our father Abraham considered righteous for what he did when he offered his son Isaac on the altar? 22 You see that his faith and his actions were working together, and his faith was made complete by what he did. 23 And the scripture was fulfilled that says, “Abraham believed God, and it was credited to him as righteousness,”[e]and he was called God’s friend. 24 You see that a person is considered righteous by what they do and not by faith alone. Let’s note, “even the demons believe that and shudder.” Demons are fallen angels and have witnessed God’s glory and been judged with their leader. They are condemned already to an eternity in torment and without redemptive opportunity in Jesus through grace by faith so they shudder. This usually comes up not from those involved in relief to the poor, but those misusing these verses to justify salvation by works of the law. But James did not say I will show you my faith by what I shalt not. Briefly, God was not preaching to you Gentiles when he said, “Do not eat from the tree of the knowledge of Good and Evil.” Nor when he told Noah to build the Ark. Not when he made the promise to Abraham that his offspring would inherit the land now called Israel, nor when he gave the law to Israel through Moses. Not until he sent Peter to Cornelius. Then Jesus ordained Paul (Acts 9: 15) as his instrument to reveal his name to Gentiles, their rulers and the people of Israel. Judah in the vast majority rejected Jesus as was prophesied. In 70 A.D. God made his intent for the law and the temple perfectly clear as Jesus prophesied in Matthew 24. TEACHERS OF THE LAW DO NOT KNOW WHAT THEY ARE TALKING ABOUT. Chris Queen. 3/26/2019. Debating on ending this blog on the 31st. These are the words of him who holds the seven stars in his right hand and walks among the seven golden lamp stands. 2 I know your deeds,your hard work and your perseverance. I know that you cannot tolerate wicked people, that you have tested those who claim to be apostles but are not, and have found them false. 3 You have persevered and have endured hardships for my name, and have not grown weary. 4 Yet I hold this against you: You have forsaken the love you had at first. 5 Consider how far you have fallen! Repent and do the things you did at first. If you do not repent, I will come to you and remove your lamp stand from its place. 6 But you have this in your favor: You hate the practices of the Nicolaitans, which I also hate. I am surprised as usual that the seminaried don’t believe the scriptures like a little child. That’s the commandment of Christ, not all this repenting and obeyeedeeance to Moses. Jesus in Mark 1 told Jews under law to repent (mistranslation) (DO PENANCE bad boy … write me a check … say your hail yeah that girl, with all the other children) where Jesus told Jews in Israel to change their minds (about 1500 years of religion) and “believe” the good news. “This is the message we have heard from him and declare to you: God is light; in him there is no darkness at all. 6 If we claim to have fellowship with him and yet walk in the darkness, we lie and do not live out the truth. 7 But if we walk in the light, as he is in the light, we have fellowship with one another, and the blood of Jesus, his Son, purifies us from all sin. “As it was in the days of Noah, so it will be at the coming of the Son of Man. 38 For in the days before the flood, people were eating and drinking, marrying and giving in marriage, up to the day Noah entered the ark; 39 and they knew nothing about what would happen until the flood came and took them all away. That is how it will be at the coming of the Son of Man. 40 Two men will be in the field; one will be taken and the other left. 41 Two women will be grinding with a hand mill; one will be taken and the other left. That “looaut [lot] of nawnsense ouut here” is what the Lord of Lords and the King of kings told you to do. So, Keep Watch.